The Salon International de la Haute Horlogerie (SIHH) in Geneva is like couture week in Paris: an event dedicated mainly to the world’s most spectacular designs. And for 2019, brands luxuriated in the hand finishing, super complicated mechanisms, and the finest materials, such as diamonds and colourful, semi-precious gemstones. Of course, high horology doesn’t come cheap (timepieces start at around $3,000 and quickly rocket north of $100,000), but when viewed in person, one cannot deny the beauty of these superlative offerings. Which is why we went to Geneva to examine the most buzz-worthy watches at SIHH up close and in person. This year, Panerai focused its sights on updating its Submersible line. The king of the collection is the PAM984 Mike Horn Edition — named after the South African adventurer and conservationist. This watch is designed for maximum readability, with a sandblasted, one-piece bezel design and green Super-LumiNova markers. The sub-seconds and hands have also been slightly redesigned and the dial tweaked, with its sub-seconds and hands slightly redesigned, and the logo, model name, “automatic,” and depth rating printed on the underside of the crystal. At last year’s SIHH, Cartier made a splash by reinventing its Santos collection. This year, they expanded the line with two entry-level Santos-Dumonts, a chronograph, and our personal favourite, the Skeleton Noctambule. 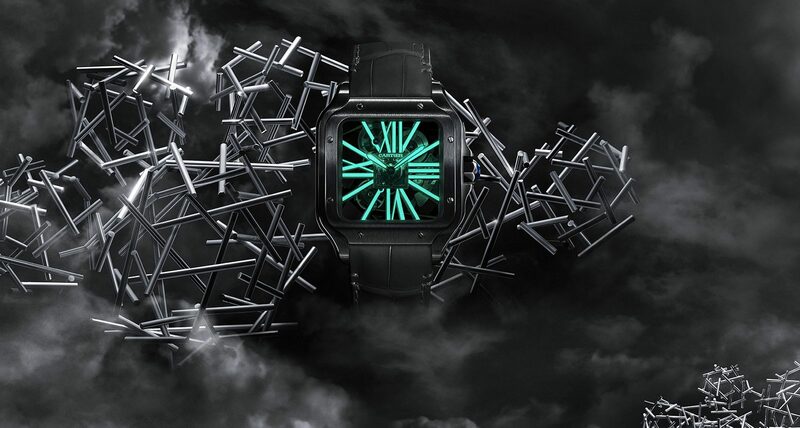 In particular, we love the all-black Noctambule (night owl en francais), which is a tribute to the watch’s namesake, aviator Alberto Santos Dumont, and his pioneering night flights over Paris. It features high visibility green Super-LumiNova on its skeletonized movement bridges, numbers, minute, and hour hands, making it look thoroughly modern. German watchmakers A. Lange & Sohne have a unique ability to produce highly complicated watches that look clean and uncluttered. This year, to mark the 25th anniversary of their post-Communist-era resurrection, they are launching a limited edition of the Lange 1 watch with a dial made of solid silver. It also comes with an additional date function, with a corrector at the 8 o’clock position that triggers a jumping date indicator and a brand new movement powered by a constant force escapement and slow-oscillating balance. 2019 looks set to be the year of the super complicated timepiece. But the Jaeger-LeCoultre Master Grande Tradition Gyrotourbillon Westminster Perpétuel is the simply one of the most complex, mechanical things that we have ever witnessed. It is also one of the most mesmerizing — we could watch the tourbillon spin for hours and listen to the tiny hammers hit the beautiful blue gongs all day. The most innovative timepiece announced in Geneva has got to be the Traditionnelle Twin Beat Perpetual Calendar. As you know, a perpetual calendar is meant to give the correct date and month regardless of the uneven lengths of months and leap years. With most perpetual calendar watches, you’ll need to wind it every few days to avoid having to reset it. The Twin Beat, however, has two escapements, each with its own oscillating frequency that the user can switch between (Active mode and Standby mode to keep the calendar running for an unbelievable 65 days.) Despite the complexity of the inner workings, the relatively slender silhouette of its platinum case gives it a contemporary edge. The most polarizing announcement to come out of SIHHL Audemars Piguet unveiled the Code 11.59 13-piece collection of simple round-cased watches. Online, critics called the design derivative. It’s only when you hold one of these timepieces in your hands that you can really appreciate the details, such as a curved crystal, octagonal middle section, and open work lugs. Yes, some of the time only Code 11.59 watches are hard to fall in love with, but even the haters have to admit that the Code 11.59 Perpetual Calendar in pink gold with a dark blue aventurine dial that sparkles like a star-lit sky is a work of art. Once again, Montblanc has drawn on its association with Minerva — the Villeret-based manufacture known for its incredibly beautiful chronograph movements — to produce a timepiece that has a heritage feel but also captures so many of-the-moment trends coming out of SIHH 2019. It has a smaller, 40 mm stainless steel case, a stunning salmon-coloured dial, and a luxe alligator leather strap for an extra elegant look. And this doctor’s watch is a column-wheel chronograph powered by a Montblanc Manufacture Monopusher Chronograph calibre MB M13.21. (It’s limited to only 100 pieces, and rose gold will also be available, but you’ll want to snap that one up in a heartbeat).